Ever since I can remember, there were two things that my mom made especially for Christmas--homemade fudge and English toffee. 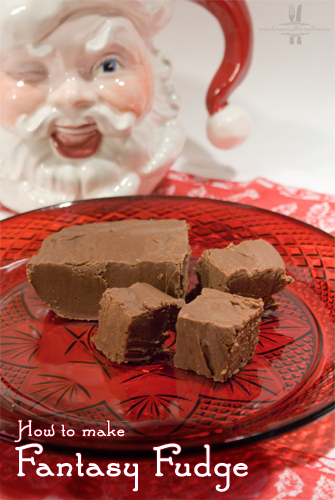 So although not technically a recipe from Grammy's recipe box, my mother's homemade fudge is such a long-standing family Christmas tradition, I needed to include it here. The whole process of making candy absolutely fascinated me through my childhood. When I was old enough, maybe 8 years old, Mom let me help out instead of just watch. 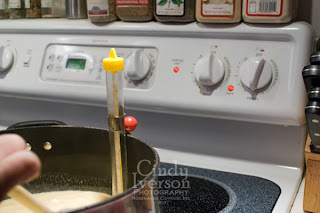 I was usually responsible for stirring because keeping the sugar and butter mixture stirring constantly was critical as it heated to the temperature desired for either soft ball (fudge) or hard crack (toffee). My mom's fudge recipe is no secret. It's the recipe that Kraft has been printing on its jars of Jet-Puffed Marshmallow Creme (an essential ingredient in fudge) for eons . The recipe is "officially" called "Fantasy Fudge". I didn't know that until I was an adult. All I knew was that Mom's fudge was the best! There wasn't any other kind of fudge from any fancy candy shop that could rival it, and I still have yet to find one. The funny thing is that it's a Kraft recipe!